OK, I know I said it last week that I was hoping that would be my last maternity What I Wore Wednesday, but alas it's Wednesday again and I'm still pregnant. BUT I can now say with confidence that this will be my last maternity WIWW post. I have an appointment today that will most likely schedule my induction. Finally, there is an end! Since this is the last time you will see me dress this ever growing baby bump, I thought I would dress it up! I can't believe I haven't showcased this dress yet seeing as it's one of my favorites. I wore it to work and around the holidays. It's an easy dress to style with tights and boots AND it just so happens to make me feel somewhat normal (even if I am the size of a house)! Dress is from LOFT Maternity but no longer available online. And that my friends is my last maternity outfit post! I would be lying if I said I would miss it. 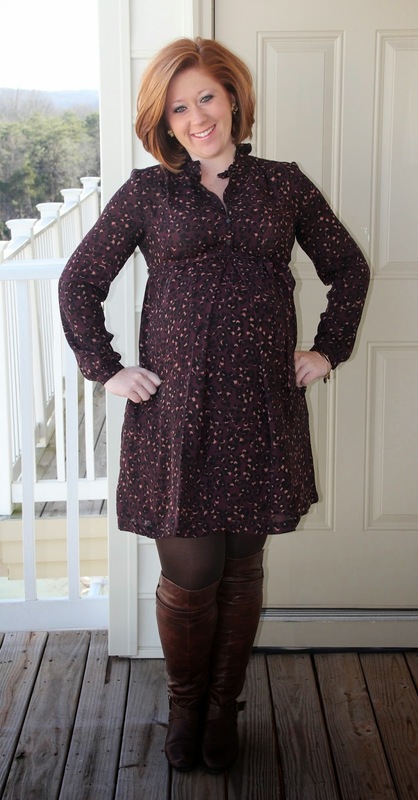 Next up....how to dress my post partum body! (I have a feeling this will be harder than dressing a baby bump). Beautiful dress! Can't wait to meet your little girl. I like your dress special one for special days. I like to share District t shirts here because when you get you kid soon so you might need some dresses like that. i will wait to meet your baby...gorgeous dress!